A small satellite built in Canada is stowed for liftoff from India on Monday on a mission to spot asteroids, especially the kind posing a hazard to Earth. The Near-Earth Object Surveillance Satellite, or NEOSSat, is the first spacecraft designed for asteroid detection, and its launch will come barely one week after a meteor exploded over Russia. The Russian meteor, which blasted out windows and injured more than 1,000 people, occurred the same day a larger 150-foot-wide asteroid narrowly missed Earth. Scientists determined the two events were not related. The launch of NEOSSat was supposed to be in 2010, but a series of delays pushed back the mission until 2013. Now the launch is occurring at a time when asteroids have reached the pinnacle of public consciousness. "It just happened that way. It's just the effect of coincidence," said Alan Hildebrand, a professor at the University of Calgary and lead scientist for NEOSSat's asteroid search mission. NEOSSat will launch Monday with six other satellites on India's Polar Satellite Launch Vehicle. The PSLV will lift off at 1226 GMT (7:26 a.m. EST), or 5:56 p.m. local time at the Satish Dhawan Space Center on Sriharikota Island, India's primary launch site on the country's east coast. The rocket's other passengers include a French-Indian ocean research satellite, a Canadian military satellite, two Canadian-Austrian nanosatellites with tiny telescopes, a small British satellite powered by a smartphone, and a CubeSat built by students in Denmark. The four-stage rocket, flying in a stripped-down "core-alone" configuration without strap-on boosters, will release all the satellites in a 487-mile-high sun-synchronous orbit within 22 minutes after liftoff, according to the Indian Space Research Organization. NEOSSat is small - only about the size and shape of a suitcase. It weighs about 160 pounds, and the satellite has a cylindrical telescope sticking out of one side. The telescope is also modest by professional standards. It measures 5.9 inches in diameter, but it is sensitive enough to spot objects as faint as magnitude 20. Jointly funded by the Canadian Space Agency and Defence Research and Development Canada, a research arm of the Canadian military, NEOSSat will collect up to 288 images per day, ultimately covering the entire sky. Half of NEOSSat's observing time will be devoted to asteroid-hunting, and Canadian military researchers will use the rest of the time experimenting with the craft's ability to spot and track other satellites in high-altitude Earth orbits. Equipped with a precise pointing system to keep the images steady, NEOSSat will resolve satellites and asteroids as they dart across a matrix of stars. 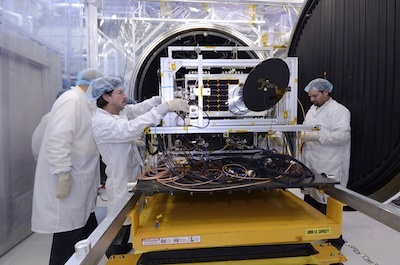 Each NEOSSat image will have an exposure time of 100 seconds, according to scientists. "We believe that, if successful, this project will deliver great science," said Guennadi Kroupnik, director of satellite communications and space environment projects at the Canadian Space Agency. "It will help to discover and to monitor asteroids and comets in the inner solar system, where there are a lot of challenges for observations from the ground." Besides making tangible discoveries, NEOSSat is a pathfinder for future asteroid-hunting telescopes. It is the first space mission specifically designed to search for asteroids, according to Canadian officials. The B612 Foundation, a non-profit organization, is raising funds in hopes of building and launching a more ambitious telescope to fly in the inner solar system and look away from the sun toward Earth, catching the glint of asteroids from a more favorable perspective. Space missions can observe the sky 24 hours a day, dodging the day-night cycle and inclement weather inhibiting ground telescopes. "Being able to predict, well ahead of time, potential close encounters is a very important part of space surveillance, and we hope to contribute to that very important objective," Kroupnik said in an interview. NASA's Wide-Field Infrared Survey Explorer, originally built to observe stars and galaxies, scanned the sky for asteroids in 2010 and 2011, finding nearly 130 new near-Earth asteroids. 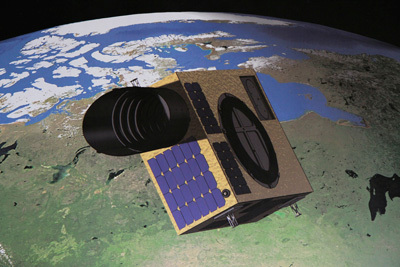 The WISE satellite carried a larger telescope than NEOSSat, and its infrared detectors made the telescope more sensitive to dark-colored asteroids. NEOSSat's advantage lies in its ability to sweep through slivers of the sky close to the sun, allowing the telescope to pick out Earth-crossing asteroids on trajectories shadowing or leading our planet on its path around the sun. The mission's top objective is to find Aten-class asteroids, objects which orbit the sun mostly within Earth's orbit. Another focus of NEOSSat's mission is asteroids which spend all of their time inside of Earth's orbit. 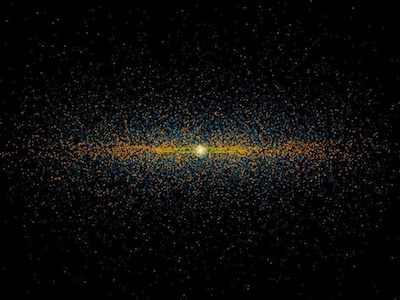 Such asteroids have mostly eluded ground-based telescopes and other space observatories. Engineers installed a baffle in NEOSSat's telescope to shield the instrument's detectors from intense sunlight. Most telescopes avoid pointing near the sun, which can damage sensitive telescope components. The WISE mission, for example, never pointed within 90 degrees of the sun as it orbited Earth. NEOSSat's objectives require it to regularly point within 45 degrees of the sun, and sometimes as close as 20 degrees. "Our search strategy is optimized to find those guys," Hildebrand said in an interview with Spaceflight Now. "It means we're looking forward and behind the Earth as close to the sun as we can, along the ecliptic plane. We cover a relatively small chunk of sky as faint as we can to discover those asteroids." Kroupnik said NEOSSat could discover between four and 12 asteroids per month larger than 500 meters, or 1,640 feet, in diameter, depending on their albedo, or reflectivity. Smaller asteroids could also be found by NEOSSat, which is due to operate at least one year. "It all depends how close an asteroid is to the Earth when it passes through the NEOSSat field of view," said Paul Chodas, a researcher in the near-Earth object program office at NASA's Jet Propulsion Laboratory and a member of the NEOSSat science team. Some of NEOSSat's discoveries could be ideal targets for future robotic or human exploration, Hildebrand said. Asteroids in orbits closely matching Earth's are easiest to reach with space missions. NEOSSat will also conduct follow-up observations of known asteroids. "[NEOSSat] doesn't cover very much sky per day, so it isn't very useful for detecting small asteroids on a collision [course] with Earth," Hildebrand said. "I think that the most useful thing that we might do there is to provide astrometry on an incoming object - if it were in a difficult part of the sky for ground-based telescopes - to establish its impact location on the Earth." Canadian scientists first proposed building a microsatellite to hunt for asteroids in 2000, but the project did not become a reality until 2005. "At the time, Canada was building another microsatellite with a small space telescope," Hildebrand said. "The question was asked, what could we do with this technology? So we explored what could be done in terms of asteroid searching, and we identified the highest value was being able to look near the sun." In order to keep costs down, officials reused a proven instrument and spacecraft design from Canada's MOST space telescope, and NEOSSat's detectors were spares left over from the MOST mission. NEOSSat's total cost, including development and operations, is estimated to be about $24 million, according to Kroupnik. Its prime contractor is Microsat Systems Canada Inc. The cost was evenly split between the Canadian Space Agency and Defence Research and Development Canada, which will use the spacecraft to test space surveillance technologies. "The unique aspect of NEOSSat is not that we will be conducting space surveillance from space, but rather that we will be conducting it from a microsatellite platform," said Brad Wallace, principal investigator for NEOSSat's military mission. "Thus, as part of our research and development goals, we will be using NEOSSat to test and demonstrate the ability of this small, inexpensive platform to support a range of space surveillance applications."